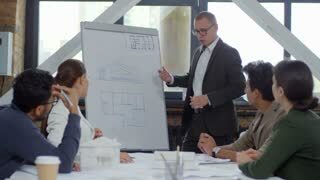 Bearded boss points to a laptop screen while focusing on his staff on aspects of the new strategy. Subordinate colleague is recording on paper the main aspects of the business proposal. 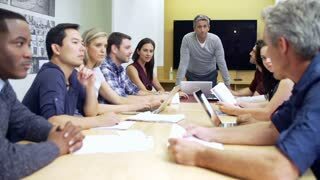 Successful beautiful European businesswoman in glasses leading a multiethnic team meeting by the table in modern office. A portrait of businesspeople walking against London rooftop view, discussing something. Slow motion. Creative business team working on project in office. Casual creative business team looking at a computer screen. Stock Trader Enters Office and Shakes Hands with a Colleague, Makes Work Related Chat with Other. Busy Office with Multi-Ethnic Team of Brokers, Dealers. Displays Show Numbers and Infographics. Shot on RED EPIC-W 8K Helium Cinema Camera. In a Secure High Level Laboratory Scientists in a Coverall Conducting a Research. Chemist Adjusts Samples in a Petri Dish with Pincers and then Examines Them Under Microscope and His Colleague Writes Down Results. Lawyer and Client Go through Documents and Contact, Finalising the Deal, Work on a Laptop. In the Modern Office. Shot on RED EPIC-W 8K Helium Cinema Camera. Beautiful Female Manager has Discussion with a Businessman sitting at His Desk. Working on Deal they Share a Laptop, Look through Documents in Modern Office. Shot on RED EPIC-W 8K Helium Cinema Camera. 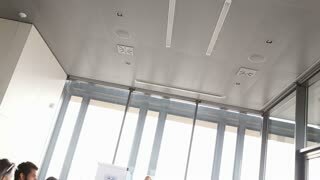 4k, Business people group have meeting and working in modern bright office indoor. Slow motion. Group of asia people waiting nervously for job interview.